Apex Legends is Respawn’s own battle royale game that is set within Titanfall’s universe (which sadly doesn’t include any mechs). Before Apex Legends got released, no one really knew about the game, there was no marketing, or anything from the major publications, just a couple of people on youtube that has only heard about the game. Despite the game just coming out of nowhere, it managed to be a massive success… And essentially became not only my favorite game but my favorite battle royale. To sum up this game: Take Overwatch, and turn it into a battle royale. Every character fulfills a different role, but all of them are viable. To name a few examples: Pathfinder uses a grappling hook, Lifeline heals, Caustic can place down gas traps, and Bloodhound can track players. Every character is different and viable, there is no better character or meta to worry about. 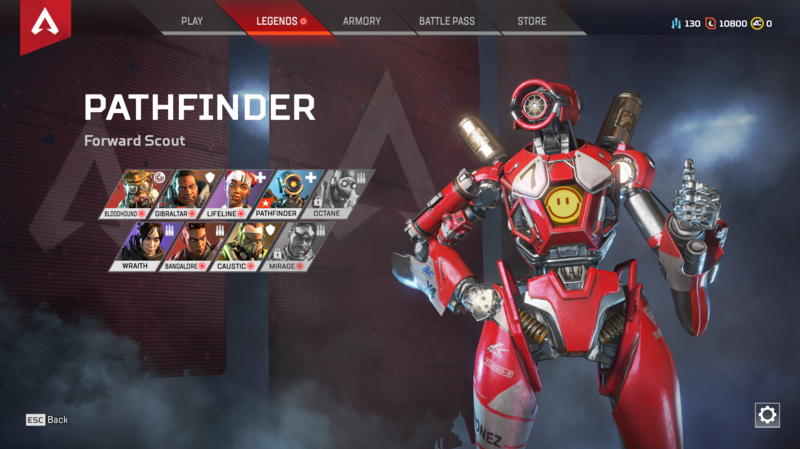 A match in Apex Legends is your standard affair, pick your character, drop down from the dropship, scramble to find a weapon, traverse around a large map with a border that will damage you, and don’t die. Of course, you’re not alone at this, as this game is purely a squads game, so you will have two other players that have your back. (until duos and solo get added in). Also when your squad picks their character, the player that goes third will be declared as the jumpmaster of the squad where they control where the squad lands, but they can always pass it over to someone else, or you can just abandon everyone and go on your own. Since the game is all about the squads, teamwork is very vital for victory. Of course, there is always the issue of getting stuck with a team that doesn’t have a mic, henceforth, they don’t communicate, but there is one simple system that fixes that issue: The ability to ping. Ping weapons, ping ammo, ping destinations, ping enemies, ping items that you need. This really makes a difference since players who don’t use a mic can still communicate with other players, without messing around with text chat. Of course as typical with Battle Royale games, if you die your pretty much out of the game, and you’ll have to leave your team behind, and have to queue for a new match… BUT! There is another standout feature: The ability to respawn. If you die in a match, you’re not completely out, your allies can pick up your banner from where you died, and head to a respawn point to bring you back into the action. You lose all of your stuff when you come back, but that’s a small price to pay just to keep playing. These two simple features really make Apex Legends stand out from the crowd (so much so that even Fortnite copied the respawn mechanic). 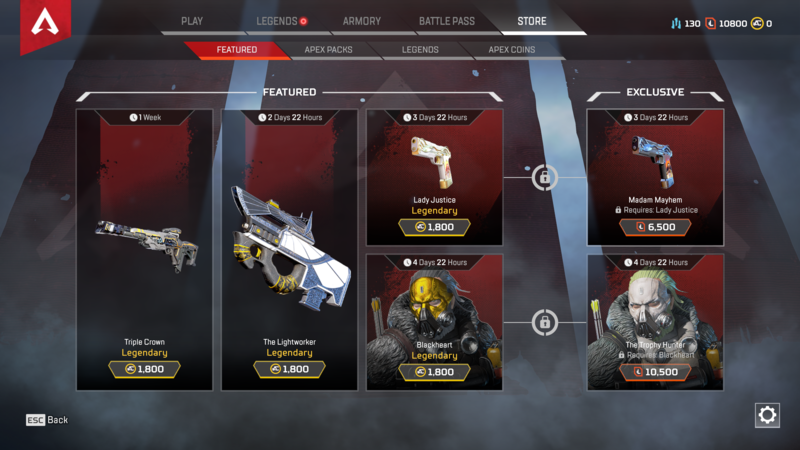 The only real downside I can think of is the cosmetics store where the legendary skins are being sold for $18.00 in Apex Coins (the game’s buyable currency). Thankfully cosmetics are the only thing being sold in the store, and offered through the loot boxes. You can only buy the additional characters with Legend Tokens which is earned in game, or the Apex Coins. If you want to drop money into the game, just buy one or two the game’s characters or the loot boxes which will not give you any duplicate items. On the other hand, you can easily earn loot boxes, just by playing the game. Apex Legends is only available through Origin and is free to play, there are optional starter packs, but are not entirely necessarily. Overall for the price of nothing, Apex Legends is a great experience if you’re looking for a battle royale with a bit more substance. Of course, that’s just my opinion.